Holidays weigh heavily on decision-makers at small and medium enterprises, as they rush to meet deadlines before the working world closes its offices for the festive season. SME Survey 2018 will highlight the levels of digital transformation in the small business sector. Coolcumba and Salt Biz partner to bring Big Magic to the world of selling, because results matter! 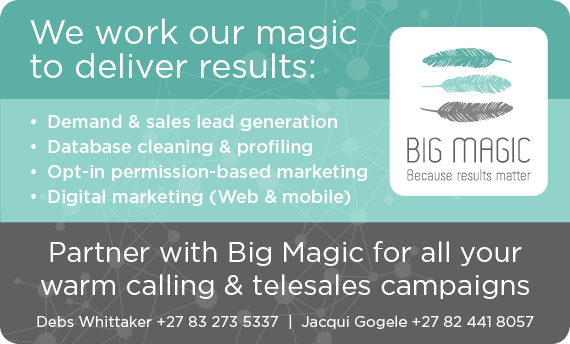 Big Magic uses 'warm-calling' techniques to provide accurate and reliable database records which our clients use to speed up and close the sales cycle. Within just three months since its launch, Rush has proven to be quite the courier business disrupter with now over 1,000 successful deliveries. Powered by WeChat, Rush is clearly keeping its promise to fundamentally disrupt the courier industry in South Africa. There are many typical reporting challenges that impact on companies and how they are able to get the most out of their financial reporting. When it comes to solving these problems, the adoption of innovative technology is one of the most obvious answers, and is the reason why the recent Excel4apps self-hosted seminar in Hong Kong proved to be such a success. Johannesburg, Monday, 23 November 2015: Rush is the new digital disruptor that is about to transform the courier business in South Africa. As a courier aggregator, Rush enables a customer using their mobile phone to choose a courier solution that meets their requirements by comparing couriers, their prices and delivery services in real-time. The uptake of cloud services in the small and medium enterprise (SME) sector has been growing steadily, but 2015 sees businesses finally beginning to wake up to the benefits offered by services like online storage and backups. If you were to ask the owners of small and medium enterprises (SMEs) what keeps them awake at night, chances are that you would be inundated with shared concerns. Based on the findings of the SME Survey this year, finance, competition and crime are some of the most pressing issues. However, crime no longer claims first place. Instead, frequent and prolonged power failures rank as the most concerning issue for SMEs. Small and medium enterprises (SMEs) in South Africa are flirting with disaster by failing to improve their policies on backing up data, which is often critical to the very survival of their businesses. Latest results indicate a massive growth in environmental awareness amongst SMEs. The small and medium enterprise (SME) market is not only considered a vitally important business segment as far as South Africa's economy goes, it is also the sector that often astonishes the most. In the current, green-focused business environment, it would not shock anyone to hear that large enterprises are motivated to operate in a sustainable fashion, but to hear the same of SMEs comes as far more of a surprise. Like many complex organisations, financial reporting for Hinterland is paradoxically a crucial task but one which presents a major obstacle for accounting personnel. When a previously cumbersome, time consuming and error-prone reporting process was replaced with GL Wand from Excel4apps, what was once a reporting nightmare was turned on its head to become an automated, flexible and easily executed process. At a time when technology tools ranging from email to social media are becoming more complex rather than simpler, many small and medium enterprises (SMEs) are struggling to cope with the rapid pace of change. Just how well they are coping and what mechanisms they use to cope are key questions being addressed by SME Survey 2015. When the only Pan African housing finance company, Shelter Afrique, implemented Oracle ERP financials, it soon discovered a limiting factor with the efficiency of the solution with regards to reporting: getting information out of the system and to the people who needed it to make decisions was just too difficult and time consuming. The problem was quickly solved with the addition of GL Wand from Excel4apps, which enabled the organisation to respond immediately to its partners' requests for real time financial information. Show the World who you really are; buy a Mandela Bangle and make a difference. Buy a Long Walk to Freedom Mandela Bangle, contribute towards a revenue stream for the schools program and help prevent the spread of poverty, inequality and HIV AIDS. When Tsogo Sun upgraded its Enterprise Resource Planning software to SAP's ERP Central Component, the company soon identified a deficiency in its ability to rapidly generate ad-hoc reports to meet business requirements. With a department staffed by Excel experts who were under pressure to meet reporting deadlines, the introduction of Excel4apps' GL Wand has transformed the ability of the company to gain insights into critical performance data, substantially reducing the time and effort for ad-hoc report creation. Johannesburg, 14 July 2014: City slickers really do have it better than country folk, at least where the profitability of their businesses is concerned. That's one of the surprise findings of SME Survey 2014, which has revealed that businesses in cities, or headquartered in cities, are more likely to be profitable than those located in smaller towns or rural areas. Johannesburg, 26 June 2014: South African small to medium enterprises (SMEs) are steadily moving to the cloud, and have a generally positive perception of government services. These are the headline results of SME Survey 2014, which tracks the perceptions and concerns of small business owners in this country. Although cloud uptake by small and medium enterprises (SMEs) remains reasonably slow, the growth in usage is not only steady, but is, in fact, almost exactly as predicted by SME Survey 2012. According to Arthur Goldstuck, MD of World Wide Worx and principal researcher for SME Survey, the interim results of the 2014 edition indicate that the level of usage today is almost exactly where it was forecast it would be, two years ago. “In 2012, just 9% of SMEs were using cloud services. Our forecast was that it would rise to 18% by the end of last year. Once you add another four months to this – taking us to the point the interim results were analysed – and the forecast should have reached about 21%. The number revealed by the survey is in fact 22%,” he says. Government support programmes for small and medium enterprises (SMEs) appear to be finding resonance with many organisations in their target audience. According to SME Survey 2014, more than half of the SMEs polled expressed satisfaction with the quality of these services. Employment Share Ownership Plan provides employees with 30% ownership. 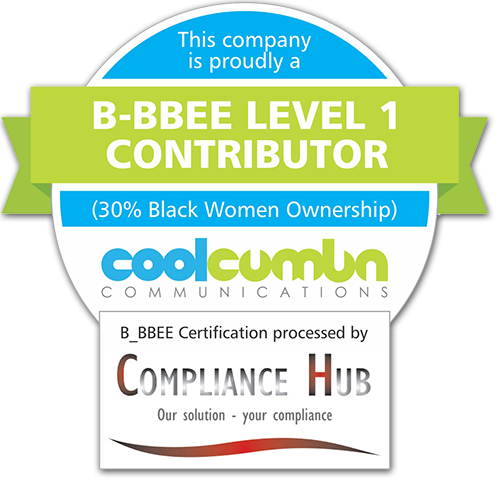 Coolcumba Communications is among the first South African organisations to adopt the new broad-based black economic empowerment (BBBEE) Codes of Good Practice. By instituting a 30% black women-owned Employment Share Ownership Plan (ESOP), a priority element in the new codes, the company has fully embraced the ownership requirements of the codes and has thus been recognised as a BBBEE Level One contributor. Johannesburg, 19 February 2014: Small and medium enterprises (SMEs) in South Africa face a dramatic shift in technology use as the triple impact of social media, Cloud computing and the “bring your own device” trend transforms the competitive landscape.